Need some flair in your Washington Nationals fan cave? 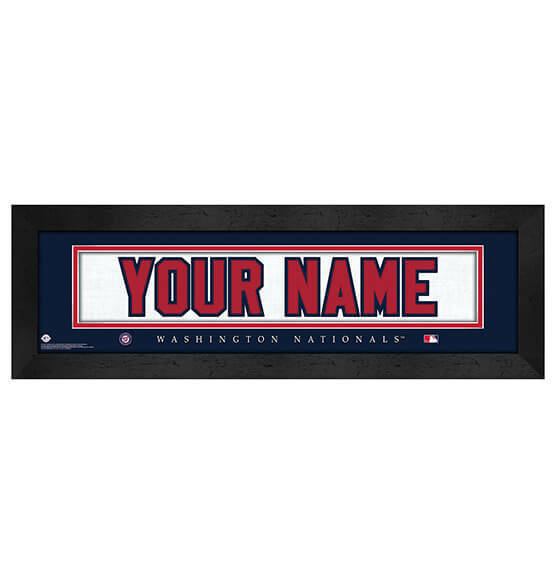 Look no further than our officially licensed MLB Personalized Nameplate Framed Wall Art at PersonalizedThings by Exposures. Designed to look like the back of a Washington Nationals jersey, this vibrant print features the team colors and team logo of your favorite National League East Division team. This product comes ready to hang with an included sawtooth hanger and features an MDF vinyl wrapped frame, paper and glass that will look great in any room. Whether you're looking for personalized sports decor for yourself or to give as a gift, you'll definitely hit a deep fly with this choice!